One of the most important aims of an individual is to live healthy and safe. Not a single person wants to spend his life paying for hospitals and surgeons, after all, we have just one life. Along with this, the primary aim of a person is to get food at a proper time. The major reason for people getting sick is because of their unhealthy lifestyle in which, food plays a primary role. Due to lack of time and patience in today’s world, most of the people are relying on the food from outside. Street food has become a trend. We could see a drastic change from a world of healthy food to a world of the unhealthy ones. We live in the era of chaats, momos, and fried food items. In urban areas, we couldn’t blame the fact that most of the people of working age are busier due to the workload, that they do not get sufficient amount of time to indulge themselves in kitchen and cooking. So, they often rely on online ordering and dining in the restaurant. Most of the food items that we consume from the outside are unhealthy due to the unhygienic conditions in which they were prepared in and also due to unwanted chemicals that they add to increase the taste and appearance such as food colors and Ajinomoto(Monosodium Glutamate). Another substance which leads to unhealthy conditions is the oil which is used in the cooking. Consuming oily food in a large amount can make you obese and using the same oil, again and again, leads to health problems. With the introduction of deep fryers such as commercial and electronic deep fryer along with other kitchen appliances has opened up our options in food. Using the traditional frying pan also cause trouble as the food soaks a lot of oil with it and the smell that arises during the frying develops stench inside your nose. With these deep fryers, you could easily extend your menu to a wide range of options. Deep fryer machine becomes handy when you have a lot of guests in your house as the amount of time it takes is just minimum. Now, you do not have to rely on the fast food joints for your fried food cravings. In this article, we will provide you with information like what is a deep fryer and its working, its benefits and features, types available in the market and a comprehensive buyers guide. Lastly, we have our top 6 recommendations to help you with your decision. What is a Deep Fryer? How does it work? Deep fryers are recent additions to our kitchen appliances that help us deep fry any food at home with convenience. Deep fryers are built for home and commercial use. The size and features are the ones which differentiate them. Home-use fryers are smaller in size. It consists of a deep walled pot which is usually made up of cast iron, black steel or stainless steel. These pots usually come along with a basket that fits with the pot to hold the food item being fried. The pot is deep so that the whole food is dipped fully inside it, which makes frying even and less time-consuming. A best deep fryer generally consists of a temperature controller so that, it would be easy to control the temperature of the oil according to the user. It comes along with a built-in thermostat to serve this purpose. The food is heater around 323-400 degree Fahrenheit. As soon as the food is placed inside it, due to the sudden heat that is developed inside the heater, the moisture of the food item is sealed. Due to the sealing of moisture inside the food, it becomes vapor, and the vapor then cooks the raw food. The tiny bubbles that form just outside the surface of the food is a gas barrier which does not allow oil to get soaked. Actually, these bubbles are made due to the water inside the food. Since water and oil do not mix with each other, the oil does not get inside the food. After sometimes, when the bubble starts to decrease at the layer of the food, most of the water inside is used and this is the perfect time to remove the food item. One thing to be considered is that the cooking temperature should be right (between 325-400) or else it would soak up a lot of oil, making the food greasy. Deep fryers come with options of an open top as well as along with a closed lid. Key Benefits of using Deep Fryers. Deep fryers have been a recent addition to our kitchen appliances and it also comes along with a lot of benefits which makes it a better option. Now by having a deep fryer at home, we would not have to rely on the fast food joints available in the market. Cooking is made easy with it and we could easily extend our menu according to our own wish and taste. With the increasing use of oil in our food, we have to cope up with the health problems arising with it. Overuse of oil in our food could make us obese and also, using the same oil again and again can lead to problems. With deep fryers we can have control of which oil to use and how much oil to use, making it a healthier option for us. Earlier, we would have to rely on the food apps to meet our taste and needs, but, fryer machine we can cook whenever we want with a minimal amount of time. Cooking has also been easy due to deep fryers. Deep fryers let you select the all the ingredients for food, and obviously, we opt for fresh food that give us better taste and doesn’t affect our health. You can have a wide variety of food which you wished for when you see them in the market. You need not worry about the unclean food, just eat tasty and crispy fried food. Fried food is something that each one of us craves for. With the traditional use of frying pans, we could only imagine food being soaked fully inside the oil and dismantling the taste. Now you could be served with your desired way of having food through your deep fryers. Well, it is just not easy to say that deep fryers are a better option than the traditional frying pans, it is because it comes along with a variety of features that attracts the customers more into buying these products. If you want to have fried food, it does not mean that you have to hover over your item until and unless it is fried perfectly at all the sides. With the traditional frying pans, you need to constantly stir your food so that it does not get over fried at one side. With this feature, even though you are not around in the kitchen, after a specific time using a timer, the alarm would buzz which would be audible and you can come around and look if it is perfectly cooked. One of the biggest problems that you face while cooking fried food is the odor that is developed along with it. It sometimes causes a stench to your nose and you need to have a good exhaust fan so that the odor is removed from your rooms. With a proper ventilation system, that odor that is developed inside the fryer is reduced and you will never experience that smell again. Using the same oil again and again for frying is injurious to health. So instead of throwing away these oils, if you have a proper filter to clean up your oil, then it would be easy to reuse that oil. It would remove the problem of throwing the oil after one use. Overheating of food destroys the taste of your food and the only option left after the food is over fried is to throw it in the garbage. Deep fryers come along with a built-in thermostat which helps to maintain a perfect temperature which would cook your food perfectly and evenly. Traditional frying pans were the only options open to you for frying food earlier which did not prove to be satisfying for the users as it soaked a lot of oil. Deep fryers are built in such a way that it produces the best crispy food than those done with the frying pans. Now you don’t have to rely on the food ordering apps to satisfy your cravings for food. As its name suggests, these are fryers that make the use of electricity for frying food items. These are usually the smaller fryers which are used for home use. They are used when the amount of food item is less. It is safer to use them indoors. If you are trying something to cook fast for your guests at home, then it would not be an apt option as it fries only a small portion and if you are looking for a bigger fryer, it would costs you very much. But, some foodies do not think that the results are good as compared to other fryers. Also, the smell which arises due to frying will linger inside it. Electric deep fryers come along with a wide range of features along with it which makes cooking simpler and faster. Propane fryer machine is an option which is considered better by the home chefs who consider the results crispier and tastier than those with the normal electric deep fryers. The tradeoff is that these deep fryers are difficult to be operated and also come along with greater risks during the use. So anyone, who wishes to use it must strictly follow all the manuals before using it. 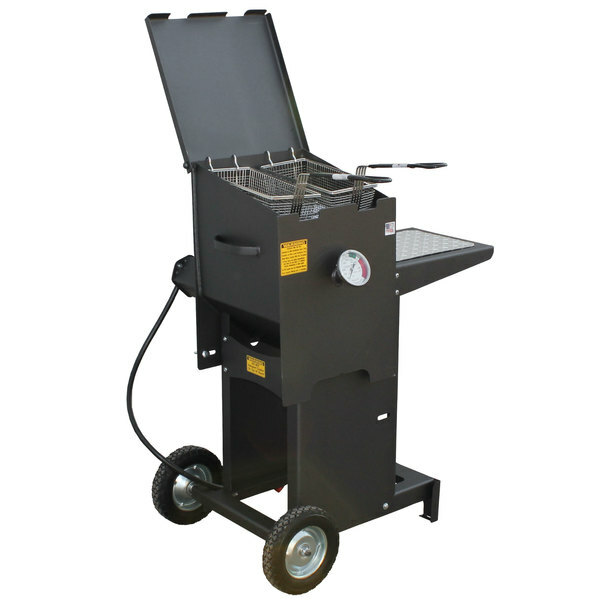 Propane deep fryers are best for outdoor use as well which would become handy if you are living in some cold region. Opting for a propane deep fryer means that you have to deal with a propane tank and must take care about its storing, refilling and moving it whenever needed which could prove to be annoying for a longer run. But, the fact is that it serves you with better food results. The air fryer does not actually come under the category of a deep fryer, but when frying is considered, oil-less frying is a bit of oxymoron. We should know what this actually is since we are talking about types of fryers. Air fryers use a technology that heats the food evenly from all the sides without even using a bit of oil. The result produces food items that are crispier on the outside and juicier in the inside. The results are distinctly different from those of the traditional deep fryers, but, they are healthier and safe to eat. It is easier to clean these friers. For those users, who are not concerned about the traditional method of “fried Food”, can go along with this product. Though they are the costlier appliances, you won’t end up with the leftover oil that goes waste after being used once. Deep fryers come in a wide variety of ranges that differ in size, operations and prices. Always have a rough idea in your mind and set the budget for your product so that it is difficult to choose from and you would not end up buying something you might not like. The energy-efficient products are helpful for a longer run which consumes lesser energy as compared to the others and which does not cause damage to your wallets. You have to choose a product by looking upon, how many members you need to serve in one go. If you have a nuclear family, you may be satisfied with the smaller ones, but keeping the guests in mind or if you want to serve a larger portion, then it is better to go along with a bigger one. Safety is one of the most important concern while considering buying a deep fryer. Since you are dealing with hot oil which can cause damage to your skin, it is better to find some product that is safer to be used. The automatic shutoff feature that comes along with some of the product will automatically turn off the fryer when it reaches a certain temperature which causes too much boiling of oil which will combust. Using the deep fryer must prove to be simpler and easy. With a wide range of features available with the fryers, you may find it difficult to operate it. After you use, it becomes a very tedious job to clean your fryer such as draining oil. 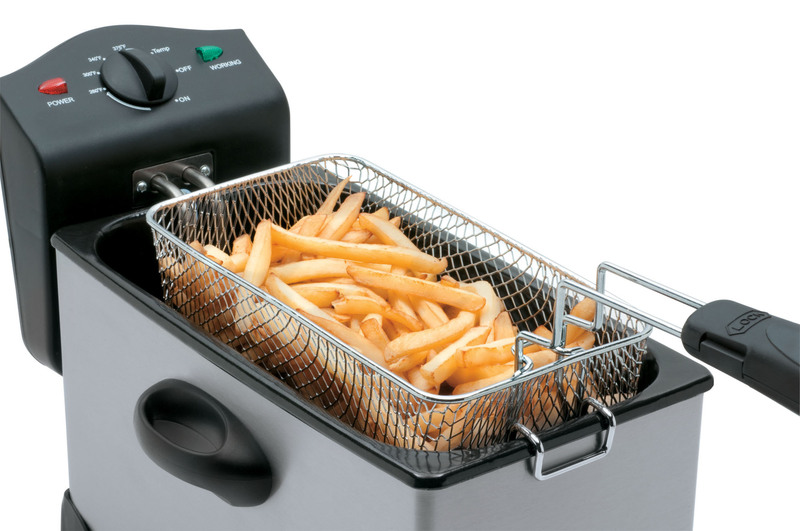 Some deep fryers come along with the easy draining process and easily detachable components. It is important what you plan to cook using the fryer, while cooking items such as french fries or patties need a different type of fryer, cooking something such as chicken needs a different fryer. Users have to keep in mind about the use of the fryer. Deep fryers must not take too much time to heat up the oil present inside it which will make cooking easier and faster. You don’t have to wait for a longer time. After buying you deep fryer, you should know that which is the best oil to fry your food items. Oils with less saturated fats are unhealthier. The one with the more is better. Coconut oil is the best to be used for frying as it can be reused after using it once. Other oils (such as palm, olives, and avocado) are also acceptable. Vegetable oils( such as soybean, grapeseed, canola, sunflower) must be avoidable as, during frying, these oil produces deleterious substances which are harmful to your health. All of the food items which needs to be fried does not require the same amount of heat. It may happen that some of them get over fried and loose its taste. Inalsa Professional 2-Litre Deep Fryer (Black/SS) comes with a solution by designing it in such a way that it has a built-in thermostat controller which maintains and controls temperature. Now, cook different food items at different temperature and do not get worried about it getting over-fried. The 2-liter deep fryer helps you to manage a sufficient amount of food in one go. If you have a family of 2-4 members, then this product is a must buy as it suffices everyone’s needs together. The 3.2-liter oil capacity frier is enough large to suffice the cravings of your family members in one go. The product comes along with a special feature which is known as Cold Zone. This helps you to fry healthier food which does not harm your body and health. Just sit back in your home, do not go anywhere and your food is ready. This product is operated at 1700 watts power which is incredible for cooking. Due to the high power, cooking is made easier and faster. It comes along with a built-in thermostat from 150 to 190-degree Celcius which allows you to control the temperature of your oil. Now cook different kinds of food in different temperature according to your own wish. It comes along with an indicator light which shows that oil has reached its optimum temperature. This feature helps you to be cautious about the temperature of the cooking oil and prevents it from getting overheated and causing damage. Its base is made up of anti-slip feet which increases its friction to the base. It would prevent from causing damages and accident due to the heated oil. The cleaning process after cooking is so easy. All the parts are easily detachable that you could clean them properly. Often, it becomes a mess to have it cleaned properly, but, since the parts are easily detachable, do not be concerned about cleaning them, Just detach them and clean them using detergents. Comes with an easy oil dispense option to remove the used oil without harming yourself. It might take too much time to get heated. ORBIT DF30 3.5 L Stainless Steel Electric Deep Fryer, Silver is a deep fryer having an oil capacity of 3.5 liters which means it is sufficient enough to suffice the needs of all the members in the family and it can be used for restaurant use as well. It comes with a very elegant design and convenient attachments that makes frying and cooking easy. The traditional frying method does not produce evenly fried items and you may not even like it, but, this product ensures that you get evenly fried items easily in just one go. The product is made up of a stainless steel body that makes it look elegant in your kitchen. It also comes along with an indicator that indicates when the oil reaches its optimum temperature. It allows you to be safe from dangers and accidents due to over-heating of the oil. The removable attachment helps to keep the fryer clean after your kitchen and you may not be concerned about it. The non-sticky coat in the deep fryer container does not allow the food items to be stuck on to its surface which would create a mess out of everything. It also comes with a frying basket which could be raised or lowered according to your own wish. It helps to remove the food from the fryer in one go. It has a Cord storage compartment which keeps the cord set in one place. Poor customer service for this product. Did it ever happen that you hosted a party at your home and you wanted to serve snacks and appetizers for them? With your present deep fryer in your kitchen, you could manage the food for only a few people. For the whole party, you would be busy just looking after the snacks and not enjoy. ANDREW JAMES Commercial Stainless Steel Double Deep Fat Fryer, 6+6 Ltrs, Silver comes with a uniques solution by bringing in a 6+6 liter capacity oil fryer which would be handy enough to fry the food for everyone together. Even if you are running a small restaurant or a food joint, this product proves to be a lot helpful. Both the oil tanks are separately controllable with its separate knobs so that, it could be easier for you to fry food separately according to your wish. It comes along with a built-in thermostat from 150 to 190-degree Celcius which allows you to control the temperature of your oil. The body of this product is made up of fine quality steel material, which gives a good life to your product. You don’t not worry about the body getting damaged after using it for some time. It is also equipped with a high-quality grade 304 stainless steel frying basket that can be raised or lowered according to your own wish. It would also help you to remove the food item after it is fried and would not create a mess. The auto-shutoff feature that comes along with this product is very useful in case of dangers and accidents that could be possible in your kitchen. When the oil gets over-heated, it shuts down the appliance on its own which would prevent from causing further damages. It comes with a lid with a viewing window which helps you to see the food being fried. It would also prevent the oil from spurting out of the oil tank. It is operated at 2.5 – 2.5 k watts power which means that cooking is made easier and simpler. Since the size of the fryer is a little bigger, it is difficult to be handled and stored if you have a small kitchen. Users with a big kitchen room and storage space/ restaurants should prefer to buy this product. Along with the single tank oil fryer, Bhavya Enterprise released the double fryer. It is a Stainless Steel Double Deep Fat Fryer (2x6L, 6oz, Silver) is also an option along with the others. So, if you think that your needs are bigger and you require a bigger fryer, then this product becomes useful. Given below are the features of this product. It is operated at a power of 2.5 k watts which means that cooking is made simpler and easier with the help of this product. Both the oil tanks are separately controllable with separate knobs so that, it could be easier for you to separately fry food according to your wish. It has an indicator light that helps to improve the visibility of the controls in temperature and all other settings in your device. The product comes along with two mesh basket which could be raised or lowered according to your own wish. It also helps the fried item to be at one place without getting spilled here and there and can be removed easily from it. It comes along with detachable parts that can be removed for cleaning purpose which makes cleaning simpler and easier. It is made up of high-grade stainless steel which means that the body of this fryer does not get damaged easily after using it for some time. It does not come along with safety features such as an auto-shutoff feature or an indicator to tell whether the oil reached the optimum temperature which increases the risk of using it. Are you tired of getting anxious about the oil being soaked by your food items when you fry the food? Well then, Skyline VTL-5424 2000-Watt Deep Fryer (Multicolour) becomes handy for your new addition to kitchen appliances. When you get back to your home tired after work, just use this and satisfy your cravings. Now enjoy a healthier version of your food cravings with just a little oil. Do not get anxious about your food item being soaked in the cooking oil and destroying its taste. It gives you crispier food results with just a little oil and it also makes it tender from inside. Now enjoy good food inside your home with no extra efforts. One of the most important task after cooking your food is to clean them properly. Often, frying foods create a foul smell that causes stench to your noise and this needs to be avoided. This product is designed such a way that it can be cleaned easily after being used. Fry basket comes with an anti-slip handle for better grip. Operates on 2000w high electricity, which helps fryer cook crispy food in no time. The fry basket which comes along with this appliance becomes handy when you need to fry your food items. The food does not spread apart and it is easy to remove after the frying process. It also does not conduct heat to your hand while cooking food. The oil tank is made up of stainless steel that is detachable, making it easy to clean. After cleaning the container, it may not be installed back correctly. The simple design, its elegant look and its high performance allow Bhavya enterprises Electric Deep Fryer, 6.2 L (Silver) to be one of the good deep fryers available in the market. The 6.2-litre oil capacity fryer proves this product to suffice the needs of everyone at your home. It could also be used if you are planning to open a restaurant or you own a food joint in the market. Given below are the features of this product. The indicator light present at the side of the knob for controlling heat improves the visibility of the temperature settings. The body of this deep fryer is made up of stainless steel of high-grade quality which helps to improve the lifetime of this product. It is also equipped along with a mesh basket, which can be raised or lowered whenever you want. The mesh designed basket also helps you to remove the food item after it is fried. It does not create a mess when you want to take out the food being fried. The parts of this deep fryer are detachable which allows the fryer to be cleaned easily. The installation of the parts after removal is also very easy which proves to be an advantage for the users. It does not come along with safety features such as auto-shutoff or any other indicating feature when the oil has reached its optimum level. It must be very difficult to choose from all the products given above. But, looking at all the features and specifications of all the product, we would suggest that Inalsa Professional 2-Litre Deep Fryer (Black/SS) could be one of the best buys for the users. The product is very handy and easy to be used which should be one of the important factors hence it is at #1 position. It has a 3.2-liter capacity which is sufficient enough to satisfy the craving of your whole family. Considering all the features of this product, this product is a perfect buy also looking at its budget, it fits into your wallet. Another product which comes at one of the tops of the above-given product is ORBIT DF30 3.5 L Stainless Steel Electric Deep Fryer, Silver because of its stylish design and its elegant looks. Most of the features are same such as the built-in thermostat to control the temperature. It comes with a unique feature of Double filter technology that removes the odor of fried food away. The cord storage compartment helps you to store the cord inside it when it is not in use. Talking about the budget, it is not much costly and can easily fit inside your budget.